This will be my last posing on the Protect Snake Valley blog site as a guest blogger in my capacity as the Refuge Manager at Fish Springs. As there is a rather incredible grapevine in the valley, I suspect most know that I will be retiring from my capacity here later this month and will be heading to my sanctuary down Torrey way. However, after spending nearly 20 years living in the West Desert, I can take the Refuge Manager out of the west desert but I can never take the west desert out of the retired Refuge Manager. The sense of solitude, the night winter stars, the serenade of coyotes twice each day, the incredible arrival of salt storms, the sense of community that stretched further than most could ever comprehend, and a myriad of other memories hewn from this unique landscape will always stay with me. Over the coming years I will continue to follow the groundwater issue with great interest. While the efforts of Clark County to take Utah groundwater may be damaged, it is not a time to lose vigilance. 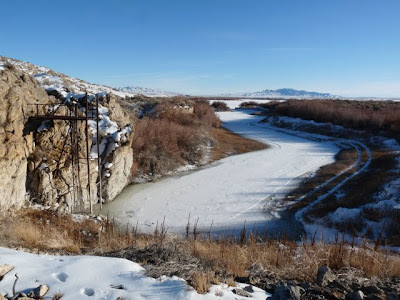 As is evidence by the many other applications for groundwater out of the Great Salt Lake flow system, the great "West Desert Water Rush" is still alive and threatening. I have come to very much admire the diligence with which the residents of the west desert have pursued and educated themselves regarding this issue. We have all had to have a crash course in Hydrology, Geomorphology, and Water Rights 101 so to speak. An educated and informed citizen is still the greatest danger to a politician. I suspect I'll still show up in the west desert on a recurrent basis. As I tell friends about the many wonder of Fish Springs, Great Basin National Park, the Deep Creek Range and points in between, it will necessitate bringing many here to gain a first hand appreciation. If they can gain the passion we all have for our "Utah outback" then we will have gain advocates in our fight to save the livelihoods and the natural character of an incredible land. Keep the faith, fight the good fight,and hang together. The MX battle showed us that it is possible to persevere against Goliath. This battle can be won as well and I've been proud to be a part and will continue to be an advocate. The Baker Community Center is open on Tuesdays from 10 am to 2 pm, and it's a fun place to stop by. I went last Tuesday and enjoyed the Mardi Gras celebration and a procession of people stopping by to visit and see what was going on. 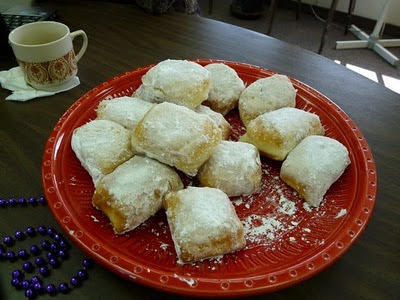 Mardi Gras is Fat Tuesday, the day before Lent starts. Lent is the time proceeding Easter that traditionally involves fasting and moderation. 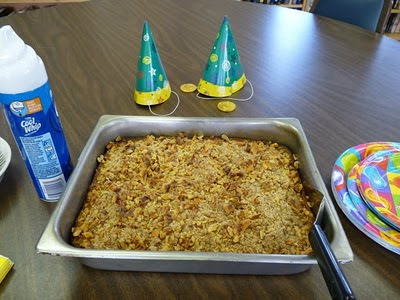 Carol made a variety of traditional Mardi Gras foods. 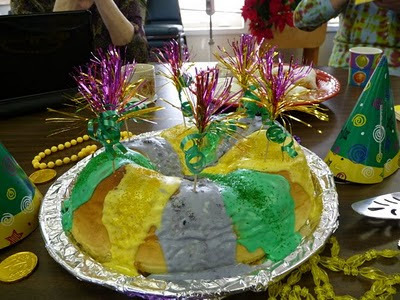 Above is a King Cake, a sweetened yeast bread. The frosting colors of gold, green, and purple are traditional and represent power, faith, and justice, and date back to 1872. Inside each cake is a token, a bean or a little figure of the Christ child. Whomever finds it is said to have good luck for a year. These beignets were absolutely delicious. In fact, I had to eat two! They are a yeast bread that is deep fried and covered with powdered sugar. Oh my, just thinking about them makes my mouth water. 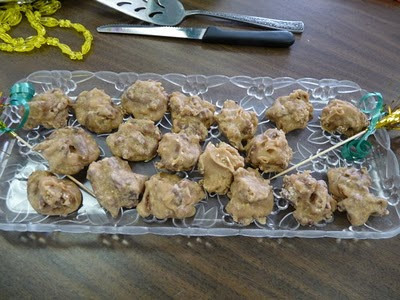 Carol also made these pralines. I sampled these, too, definitely ruining my appetite for lunch. They were worth it! Reita brought this scrumptious nut cake. I certainly wasn't expecting all these goodies when I went! Every Tuesday there's something different going on at the Community Center, but one constant is good companionship, so come join the fun! 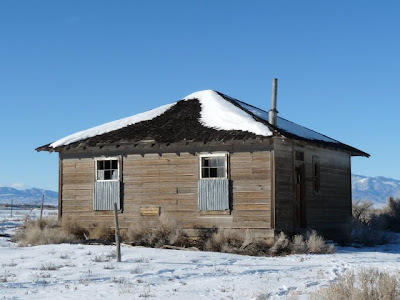 We're not having a super wet winter, but the snow we have is sticking around, making some of the abandoned buildings in Snake Valley seem even more desolate. Whenever I see old buildings like these, I always wonder about the people who lived in them and what they did and how they survived the winters. 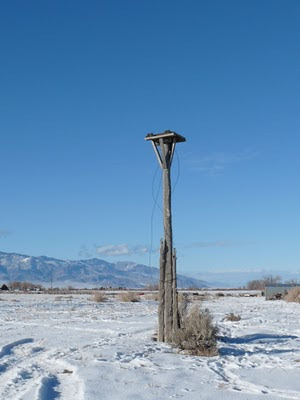 Here's one of the old telegraph poles south of Garrison. There was a telegraph line out to Burbank and I think also one to Milford. 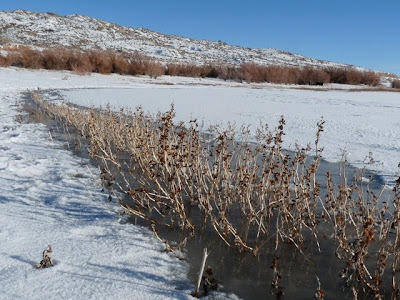 Although the water level in Pruess Lake (Garrison Reservoir) is slowly being replenished during the winter, the water is still low enough that there is a line of burdock between the shore and the ice. These nasty plants have little burs that cling to shoelaces. Standing on top of the century old dam, one can see how low the water is. The dam was built with bricks that were fired in a kiln up on Snake Creek. The original dam was built by water prospectors who thought they could entice people to come out to Snake Valley and make big bucks farming. They promoted the steady water supply they were developing with the dam. They were better promoters than geologists, though. The rock you can see in the photo above on the left is limestone, and the porous nature of this rock meant that the water could never get near the top of the dam. The huge tracts for farming across the valley never emerged, although one can see the miles-long ditch from the air (and partly from the road) that extends north from Pruess Lake to Garrison and then across the stateline into Nevada. That round of water prospecting didn't turn out so well, and we're hoping current attempts meet the same fate.